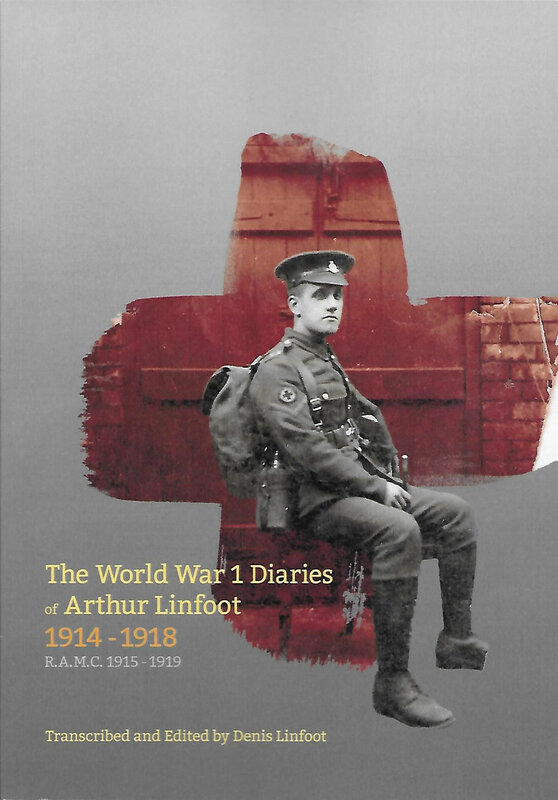 ﻿ The Diary of Arthur L. Linfoot | 58th Field Ambulance, R.A.M.C. Perhaps due to wartime paper restrictions, the diary which ALL obtained for 1918 provides only half a page for each day’s entry: 6.0cm x 4.0cm, with 9 ruled lines. On many days ALL did not fill the space available, but there are quite a lot of days when the space available must have limited his entry. On the other hand, the narrow ruled lines seem to have elicited neater shorthand1. And God shall wipe away all tears from their eyes, & there shall be no more death; neither sorrow nor crying; neither shall there be any more pain, for the former things are passed away. The latter often-quoted excerpt is from chapter 21, verse 4 of the Book of Revelation2. The former quotation, also a popular one, is the second half of the first stanza of Tennyson’s poem Crossing the Bar – correctly quoted: it is often given as “at the bar”. ALL had a copy of Tennyson’s works, inscribed on the flyleaf “From Charlie to Arthur with congratulations on his 21st birthday”. This was Charlie, ALL’s younger brother3, and the 21st birthday was in 1911. The volume is published by Collins, in red morocco leather, 16 x 10cm, gilt edges, 15 full-page illustrations, undated. There is a ribbon book-mark, which has been left at a page in the middle of Part iv of The Princess, and on the page so marked the last seven words of the line “O tell her, brief is life but love is long” have been firmly underlined in pencil, with a cross at each end of the line. A less-than-exhaustive glance through the volume does not reveal any other marked passage, least of all in Crossing the Bar, which has so far not been found in the collection – and neither the title nor the first line appears in the indices. Crossing the Bar is said to have been composed following a serious illness, either on board a ferry to Farringford or on a yacht anchored in Salcombe, so it was presumably never a part of a longer work. It was written in 1889 (Tennyson died in 1892), and although it appears in very many anthologies, it is difficult to discover where it was first published; it does not seem to have figured in any collection of Tennyson’s works in his lifetime, and it cannot be traced even in the OUP edition of Tennyson’s works published in 1911 – an edition which not only lists all the contents of (apparently) all published collections of Tennyson’s poems up to that date, but also provides an ‘Appendix of poems not included in the author’s final edition’; among which it does not figure. All too clearly, this did not happen either in the 1911 OUP edition (which there is no reason to think ALL ever saw – but which one would expect to be authoritative), nor, apparently, in the Collins edition which Charlie gave to ALL – so where did ALL copy the exact words from? Perhaps, like the words from Revelation, the poem became widely quoted as the War progressed? Perhaps it was in Everyman5?